Check out a special issue of The Bridge, Midlands Middle College’s student newsletter, written, designed and published entirely by MMC students! This special issue features exciting graduation news and highlights. Forty-eight students are Midlands Middle College’s first graduates since the school achieved designation as a South Carolina Public Charter School last year. Check out the May 2014 issue of The Bridge, Midlands Middle College’s student newsletter, written and designed completely by our very own students! In this issue, read about recent job shadowing experiences, student achievements, Parent University Night, TransformSC Schools’ Staff Seminar and our first ever prom! On May 6, 2014, on the Airport Campus of Midlands Technical College, Midlands Educational Business Alliance (MEBA) presented a Parent University “Hot Jobs in South Carolina.” The moderator of this university night was Tom Ledbetter from Midlands Technical College. Guest panel members included Val Richardson, Palmetto Health; Tom Trively, SCANA representative; Brian Andrews, PurePower Technologies; Alicia Thibaudet, IT-oLogy; and Ralph Young, FN Manufacturing. Check out the March-April 2014 issue of The Bridge, Midlands Middle College’s student newsletter, written, designed and published exclusively by MMC students! In this issue, read about our field trip to Boeing, Tom Ledbetter’s presentation on financial literacy, Colonial Life career exploration opportunities, a special soft skills workshop for male students and USC’s Trio program. 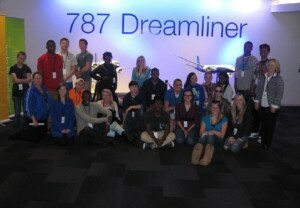 MMC students participate in Boeings DreamLearners program. On March 12, 2014, more than 20 MMC students accompanied by faculty and board representatives traveled to Charleston, SC, to participate in Boeing’s DreamLearner program. Students were greeted by a DreamLearner representative and received security badges before being to the escorted from the Welcome Center of Boeing to the 88- 30.4 Tour Balcony, where they learned the history of Boeing and its developments in the aviation industry. From the balcony, students were able to witness five 747 Boeing planes being built. The tour also included hands-on activities and videos which demonstrated how the planes are built, countries which supply materials for the planes and why Boeing builds the safest, most efficient planes in the world. 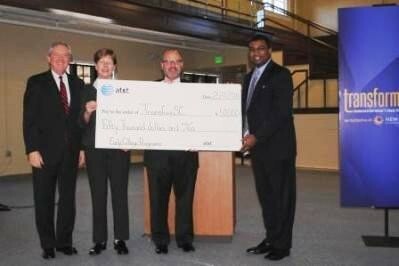 MMC, a TransformSC Early College program, awarded part of a $50,000 donation from AT&T. Picture from l to r: Jim Reynolds; Carole Fearrington; Ben Green. Midlands Middle College, is one of two programs selected to benefit from AT&T’s $50,000 contribution to TransformSC Early College programs. The contribution was announced Monday, February 24, during the Transform Update Forum on the Spartanburg Community College Downtown Campus. South Carolina Charter District’s Midlands Middle College and Spartanburg School District Seven’s Viking Early College are both set to receive funding. Check out the Winter 2014 issue of The Bridge, Midlands Middle College’s student newsletter, written, designed and published entirely by MMC students! Read about MMC’s selection as a TransformSC school and our recent parent orientation. Issue features also include a Profile of a SC Graduation; Workforce 2020: Employer Expectations; and MMC students enrolled in MTC classes. Check out the Fall 2013 issue of The Bridge, Midlands Middle College’s student newsletter, written and designed completely by our very own students! Read more MMC’s designation as a SC Public Charter School, fall orientation, Providence Hospitals student sessions and our wellness project.